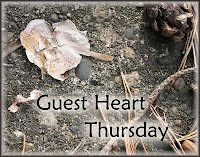 I caught this Dark Heart floating over the walnut trees in the back yard a few days back. 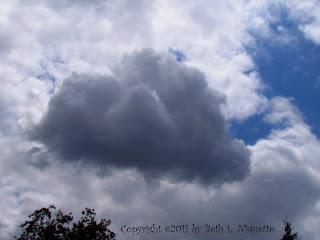 I was just amazed by its beauty--I was able to capture only the essence of the heart I saw in the skies that afternoon. Do you notice the perfect triangle in the center of the heart? I am ever amazed at the perfection of various shapes to be found in the clouds--this includes circles such as you see here. What a beauty! So perfect. Watching the sunset is something I love to do. I'm always so glad to have my camera near when the clouds do something like they did in this wonderful photo. I was in awe the night this Motley Square cloud floated across the skies, just as the sun lowered behind the hilltops. Yes, this is a cloud heart--but a bit fraggled. That's the word I use for clouds "fraggled" by the air currents. They're fun to watch. This heart was gone in a trice!